$16.08 NOTE: Our shopping cart is disabled. We are using it to display affiliate items which if you click on PURCHASE in the PRODUCT INFORMATION by scrolling below or click on the Amazon banner the RRDi receives a small affiliate fee upon completion of your purchase. Mahalo. NATURAL ROSACEA CREAM TREATMENT. A moisturizer for redness, inflammation, acne and the irritation that comes with any of the four types of Rosacea. You may have used many Rosacea skin care products before but with our powerful and organic formula we target all the signs and symptoms for optimum results. ORGANIC AND BOTANICAL INGREDIENTS FOR ROSACEA. With Aloe Vera, Manuka Honey, Cehami, Plumeria, Olive Oil, Coconut Oil as well as Hempseed and Olive Oil we give you an approach to handling your Rosacea naturally. PH BALANCED FOR FACE AND EYES. Our cream contains every Vitamin, Mineral, Trace Mineral and Amino Acid your skin needs to MOISTURIZE, NOURISH, PROTECT and REPAIR all 4 different types of Rosacea. NO WATER, PARABEN FREE, FRAGRANCE FREE, PETROLEUM FREE, NEVER TESTED ON ANIMALS AND NON ALLERGENIC. A perfect and organic formula for reducing redness, dryness, and inflammation making it the best face cream for rosacea. MADE IN USA WITH ORGANIC INGREDIENTS. This cream is made as a moisturizer for acne prone skin or Rosacea. The perfect add on to your rosacea soap or acne wash. This Rosacea care cream also helps with the blemishes caused from the inflammation making it optimum for rosacea or acne scar removal. -Receive soothing results from dryness, redness and itching. -Our superfoods and vitamins, minerals, trace minerals, amino acids, olive oil, coconut oil and many other powerful ingredients will help you repair your skin. -Also safe for infantile pityriasis rosea (Baby Rosacea) as our product is completely safe for use on children and babies. 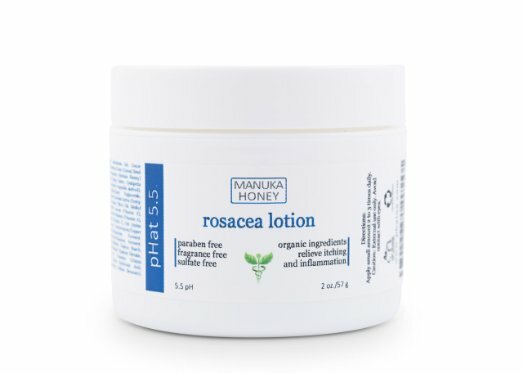 -According to the Skin Care Guide, Manuka Honey is a beneficial remedy for rosacea. It can be applied directly upon the skin and can reduce inflammation and redness, prevent scarring and promote healing. -Aloe Vera contains a powerful anti-inflammatory that effectively cures and treats many skin conditions. It comes as no surprise that Rosacea has now been added to the list. -A new study from a Dermatologic Institute in Rome shows that a topical treatment based on MSM can be effective in treating stage I-III rosacea patients. -Topically applied coconut oil helps reduce inflammation while promoting tissue skin care healing and repairing damaged skin. Applying coconut oil to Rosacea also helps to improve the appearance of the inflamed skin, reducing redness and bumps. -Botanical Online notes that the use of olive oil may improve Rosacea symptoms. pHat 5.5 is confident in its products. If it does not work for you after 60 days then you get your money back. There are many different rosacea care products which can vary from a Rosacea cleanser, Rosacea Moisturizer, Rosacea face cream or a claim of Rosacea cure for acne Rosacea. Only phat 5.5 approaches your Rosacea from so many different angles. Give your skin the treatment it deserves. Get pHat 5.5 for your skin today and see the results happen.